This Bible book is written with a devotional focus and consists of 30 Bible Stories accompanied with 60 beautiful and soulful illustrations. Each Bible story is accompanied by a question as well as a little prayer that will encourage more in-depth reflection and dialogue between parents/reader and child. At the end of the book a compilation of Bible verses, important messages as well as prayer guidance are made available as a relevant appendix to refer to. This length of each stories is from 3-5 minutes and is perfect as part of a bedtime routine. The Bible Storybook for Starters has been developed to provide an important tool for any mom, dad or grandparent who wish for the opportunity to enhance the spiritual development of their child or grandchild. 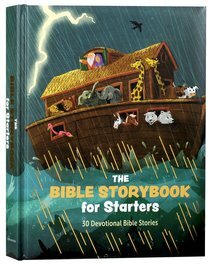 About "The Bible Storybook For Starters: 30 Devotional Bible Stories"